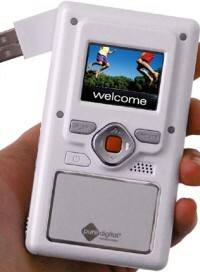 Pure Digital launched a camcorder that lets you upload videos to Google Video and Grouper at the click of a button, if you connect it to the computer. "Anything you can do to give people powerful technology and simple ways to use it will increase the attractiveness of online video," said Hunter Walk, a Google product manager, for USA Today. The camcorder will cost $129 for the version that records 30 minutes of video clips and $169 for the 60-minute version. Mobile phones should also have an option like "Upload to Google Video" and this will bring online journalism to a higher level. This way, online video sites could be the first to have breaking news.